Home Politics Election FactCheck Q&A: was Jacqui Lambie right about apprenticeships and 457 visas? Excerpt from Q&A, May 30, 2016. Apprenticeships and jobs are back in the news as the election campaign reaches its halfway mark. She also said one of the reasons jobs are scarce is because Australia has “over a million 457s out there”. So are those two claims right? The Conversation asked a spokesperson for Senator Lambie for sources to support her assertions. The apprenticeship statement was not addressed in his reply, but there was a detailed response on the question of visas – so we’ll examine that issue first. We’ve received information from the Parliamentary Library that all Temporary visa entrants listed on page 3 are able to work at least a minimum of 20 hrs per week. This includes Visitor Visa Holders, Student Visa Holders, Temporary Skilled, Working Holiday Maker, Bridging, Other Temporary Visa Holders and Temporary Graduates. Senator Lambie used the term 457 Visa in its broadest or commonly known term – which included Overseas visitors or Temporary Entrants who are awarded primary 457 work visas and all other sub categories of 457 visas – which of course allow any Overseas visitor or Temporary Entrant to work in Australia. Including Overseas Visitors from New Zealand (634,560) all of the 1,986,420 Temporary entrants listed (assuming they are of the correct or legal work age) – are able to legally work in Australia. So by these figures it is correct to say that in Australia today, there are over one million Overseas Visitors or Temporary Visa Entrants – who are working – and therefore this fact adds to the reasons why Australians are unable to find employment. “Over a million” 457 visa holders? The Department of Immigration and Border Protection issues regular statistics on the number of temporary residents in Australia, including 457 visa holders. The 457 visa allows someone sponsored by an employer a temporary right to live and work in Australia. The visa applies to skilled workers whose skills or qualifications enable them to work in an occupation on the Consolidated Sponsored Occupation List issued by the federal government. In addition to the annual statistics, the Department of Immigration and Border Protection releases quarterly data. 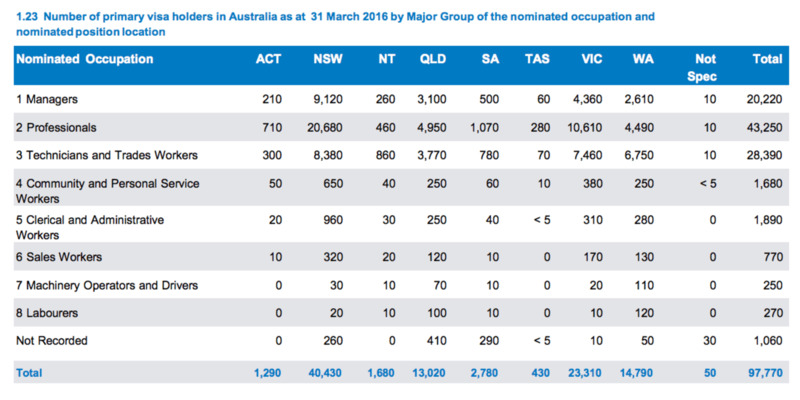 The most recent figures available from the government in its Subclass 457 quarterly report show that as of March 31, 2016, there were 97,766 people on primary 457 visas in Australia. This is 9.2% lower than the number of primary 457 visa holders in Australia 12 months earlier (see page 7 of the report). Most 457 visa applications granted in the 12 months to March 31, 2016, were for professional occupations (55.4%). Less than a quarter (23.1%) were for technicians and trades workers, where training is traditionally through apprenticeship. There were also 79,624 secondary 457 visa holders as at March 31, 2016. These include the partners, children and other dependent relatives of primary 457 visa holders and they also have work rights. So Senator Lambie’s statement that there are over a million 457 visa holders in Australia is incorrect. The figure is closer to a rounded up 98,000 people (or about 177,000 if secondary visa holders – not all of whom are working – are included). Working holiday 417 visa holders: There were 155,183 working holiday maker visa holders (both 417 and 462 visas) in Australia as at December 31, 2015.
International student visa holders: There were 328,151 student visa holders (including 570, 571, 572, 573, 574 subclasses) in Australia as at December 31, 2015. These people may only work up to 20 hours per week. Temporary Graduate visa holders (subclass 485): To be eligible for this visa, a person needs to have been an international student resident in Australia for at least two years. There were 23,870 in Australia as at December 31, 2015. Other visa categories referred to by Senator Lambie’s office either do not allow visa holders to work (such as visitor visas) or only allow visa holders to work under certain circumstances or if certain conditions are met (such as bridging visas). These figures also do not include New Zealand citizens or categories of permanent skilled migration or other categories of permanent migration (such as family reunion and humanitarian). Technically, New Zealand citizens living in Australia hold a temporary visa: it is referred to as a Special Category Visa (SCV). But with very few exceptions, all New Zealand citizens have an automatic right to live and work in Australia, under the terms of the 1973 Trans-Tasman Travel Arrangement. 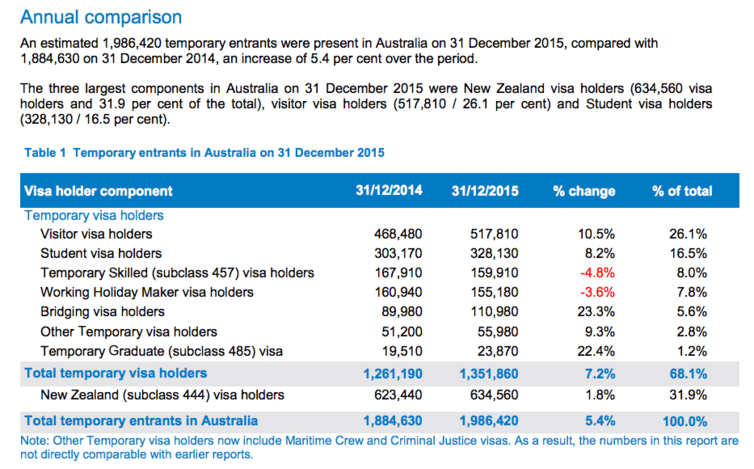 As at December 31, 2015, there were 634,560 New Zealand subclass 444 visa holders. So if you add all of the primary 457 visa holders (97,766 people) together with their relatives with secondary 457 visas (79,624), as well as working holiday visa holders (155,183), international student (328,151) and temporary graduate (23,870) visa holders together, the total number (684,594) is still considerably less than a million. Are apprentice numbers in decline? Senator Lambie also raised concerns about apprenticeship numbers. The National Centre for Vocational Education Research (NCVER) produces quarterly reports on Australian apprentices. It estimates the number of apprentices currently in training using administrative data on the number of commencements, completions, cancellations and withdrawals. Technically, an apprenticeship is a contract of employment combined with a contract of training, leading to a nationally recognised qualification. This includes apprenticeships in traditional trades such as construction, electrical and engineering. It also covers traineeships in service industries such as retail and hospitality, which are generally shorter than traditional apprenticeships. According to NCVER’s most recent report, which covers the September 2015 quarter, there were 295,300 apprentices in training. Of those, 181,700 were in trade occupations and 113,600 were in non-trade occupations. The number of apprentices in training has declined for the eighth successive quarter, as shown in the chart below. The decline has affected both trade apprentices and non-trade apprentices, but the decline has been steeper among non-trade occupations. The number of apprentices in training in September 2015 was one-third lower than it was in the same quarter five years earlier. Apprentices in non-trade occupations have declined by half (51.4%). There was a more modest decline among trade occupations (13.6%). Over the same period, the Australian workforce increased by 6.4%. Apprentice numbers are closely tied to the economic cycle and overall distribution of employment, but previous research shows there may be other reasons. For example, the steep decline in apprenticeships in non-trade areas in 2012 followed the then Labor government’s decision to withdraw most employer subsidies from apprenticeships in occupations that were not associated with skill shortages. Post-training employment outcomes are generally much stronger for apprentices in trade occupations than those from non-trade occupations. Jacqui Lambie was correct about apprenticeships going “wayside”, or falling. National Centre for Vocational Education Research figures show declines for both trade and non-trade apprentices. But her assertion that there are “over a million” 457 visa holders in Australia is wrong. Even counting additional visa types, the number of temporary residents validly working in Australia is still far less than one million. This is a sound analysis of Jacqui Lambie’s comments on apprenticeships. The FactCheck author accurately highlights the declining apprenticeship commencement figures, and the broader economic and political factors influencing apprenticeship commencements.